Community members pay respects to the six shooting victims during the memorial at Oak Creek High School last week. Editor's note: Valarie Kaur is the founding director of Groundswell, an initiative at Auburn Seminary that combines storytelling and advocacy to mobilize faith communities in social action. Her documentary "Divided We Fall" examines hate crimes against Sikh Americans after 9/11. Kaur studied religion and law at Stanford University, Harvard Divinity School and Yale Law School, where she now directs the Yale Visual Law Project. Follow her on Twitter: @valariekaur. (CNN) - Last Saturday morning, when media crews outside the Sikh gurdwara (house of worship) in Oak Creek, Wisconsin, packed up their trucks to chase the news of Mitt Romney's choice for vice president, Sikh Americans were left reflecting on six days of unprecedented national attention. 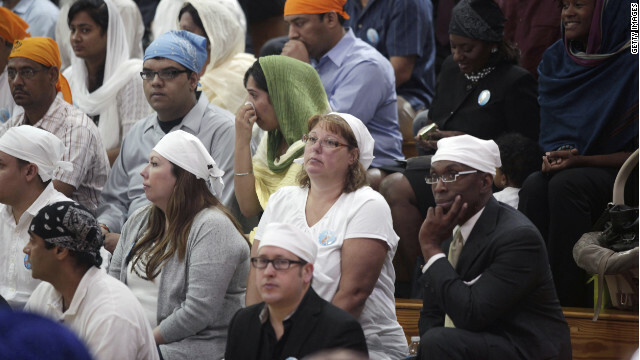 After the shooting of six people in a Sikh gurdwara, a stream of national leaders, from the Rev. Jesse Jackson to Gov. Scott Walker, came to offer condolences and support. But there was one person missing. It was you, Mr. President. Let me be clear: Your administration's response to the massacre has been strong and swift. Attorney General Eric Holder addressed mourners with compassion and resolve at the Friday memorial. : "In the recent past, too many Sikhs have been targeted and victimized simply because of who they are, how they look, and what they believe," he said.. "This is wrong. It is unacceptable. And it will not be tolerated." Joshua Dubois from the White House expressed his full commitment to helping us with sustained interfaith and education outreach. The FBI and Department of Justice were at the top of their game, investigating the attacks as both an act of domestic terrorism and a hate crime. But we need more than government cooperation. Our community needs the deeper spiritual and emotional assurance that we are welcome to live, work and worship as fellow Americans. The gunman, Wade Michael Page, was a member of a white supremacist group that wishes to destroy our very claim to call this country home. After the attack we endured, Sikh Americans, and all brown and black people in America for that matter, need our president to directly show the nation that we belong here. 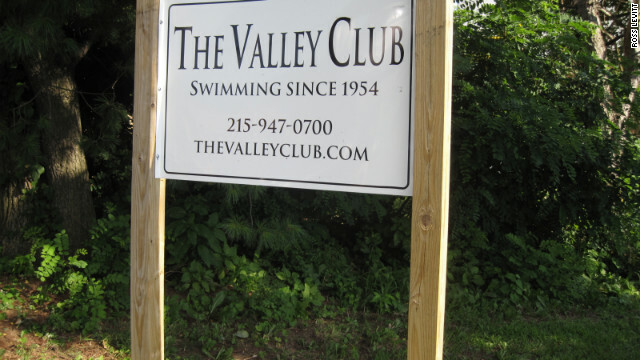 The Philadelphia-area Valley Swim Club filed for bankruptcy because of legal bills and liabilities. (CNN) - A now defunct suburban Philadelphia swim club has agreed to a settlement more than three years after being accused of racism and discrimination for denying children from a largely minority day-care center access to their facility, the U.S. Justice Department said. Under the terms of the deal with the Justice Department and the Pennsylvania Human Relations Commission, the Valley Club of Huntingdon Valley - which filed for bankruptcy in November 2009 and had its property sold for $1.46 million the following June - agreed to payouts to more than 50 children who were part of the Creative Steps Day Care Center, their counselors and Creative Steps itself. The distributed money includes whatever "remaining assets" from the sale of the club's property to Congregation Beth Solomon of northeast Philadelphia are leftover, once closing costs and associated fees have been covered, the Justice Department said Thursday in a press release. The settlement also sets aside $65,000 to create a leadership council made up of former Valley Club members, Creative Steps counselors, campers and their families. "No one may be denied the right to use a swimming pool because of their race or the color of their skin," said Thomas E. Perez, the assistant attorney general heading the federal department's civil rights division. Shimme Siddika attends Girls Who Code, a New York summer camp introducing young women to the world of technology. New York (CNNMoney) - Most school-aged girls spend July and August catching some Z's and sun. But for some girls, summer is all about learning HTML and developing mobile apps. A growing handful of summer camps are popping up around the country with the mission of teaching young women core skills in technology - a field dominated by men. Girls Who Code, an eight-week New York summer camp, immerses 20 high school girls in a tech training boot camp. Eight hours a day, Monday through Friday, the young women learn about a wide variety of tech topics from robotics to website design. Guest speakers include an eBay executive, a venture capitalist, and a technology entrepreneur among some other in-the-know tech personalities. But participants don't spend all day in the classroom: They also take field trips to Facebook, Google, Twitter, the United Nations and Gilt. For their final project, Girls Who Code students develop and present an app. "All the field trips have been so interesting and I can always find myself relating to parts of the topics presented," said 15-year-old Mahlika George, who's heading into her junior year at Medgar Evers College Preparatory School. Girls Who Code founder Reshma Saujani said the organization hopes to get more girls interested in technology and consider the field as a real career possibility.